Auchtoon! » Go Green! Go White! …Go Teal! Go Green! Go White! …Go Teal! 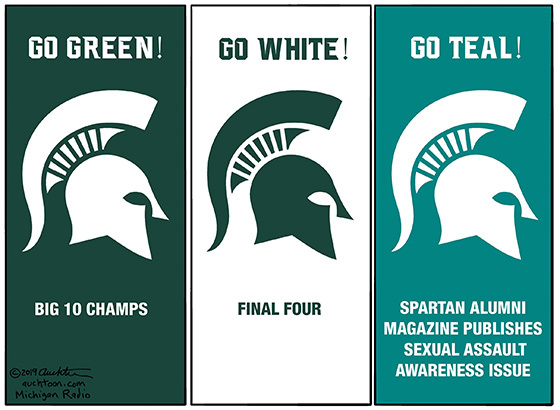 This editorial cartoon actually happens to be an expression of pride — for Michiganders in general and the Spartan Nation in particular. Obviously their men’s basketball team has had (and hopefully will continue to have) a spectacular season. It’s not hard to support that. What may be less obvious is a recent decision by the school that is also highly supportable. Teal is the ribbon color commonly worn to support victims sexually assaulted by Larry Nassar, who perpetrated many of his crimes while an employee of MSU. Last summer, the school was prepared to publish a “teal” issue of its alumni magazine, which included stories addressing and owning responsibility as well as lessons learned. Campus officials spiked it. Instead, an issue was published that included a lot of “everything is fine here” featuring interim president, John Engler.